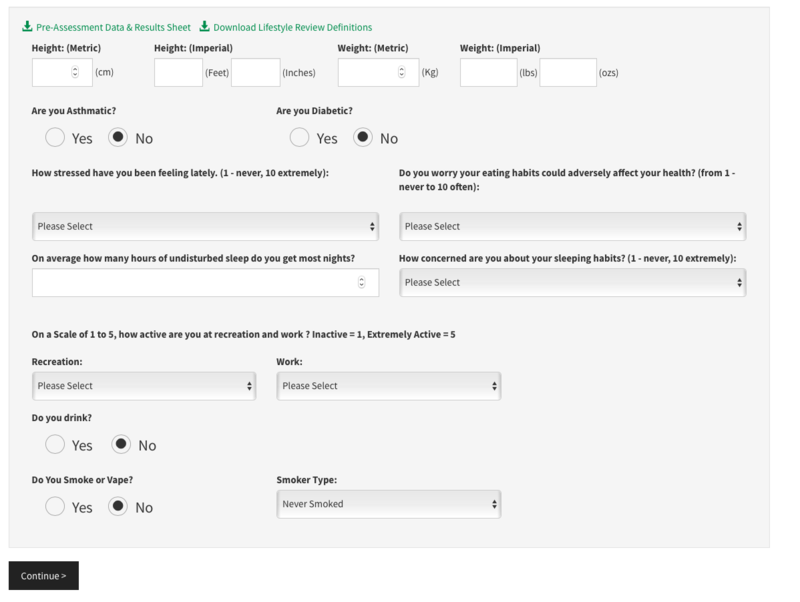 The personal health and fitness status reports are graphical and written in plain English. Graphical comparison summaries are also available when the subject has received multiple assessments. Report front covers can be branded as required. If the application owner is delivering to multiple clients under different brands. reports can be sub branded. The application uses ‘Assessment Templates’ to bring together into a single process the data points that you are collecting. There is no limited to the number of assessments templates you can have. Each template has a unique name, the typical convention is to give it a descriptive/functional name such as ‘Initial Assessment’ or ‘Six Month Review’ for example. Assessments do not have to be fully completed in the first instance, for example you may be awaiting test results. Multiple operators (subject to security settings) can work on the same subject report both before and after the conclusion of the consultation. The application is hosted on online and can be access via all forms of digital media. The data input process is simple and always follows a logical process. Our system automatically detects if the focus of the assessment, we refer to as the subject, has had an assessment before. This avoids duplication. The data input screen is broken down into logical segments. There are infinite number of tests that can be created to support your operational needs. Each test you create stores a results value and provides textual analysis on the subject’s report. You can create and include an unlimited number of these tests as required. Subject date fields, which we call Configurable Codes, are a means to collect data that relates to the subject current status as an opposed to an assessment which looks at a moment in time. For example, you may wish to identify shift workers, contractors and or job role. These data points can then be used to filter data analysis reports or just used to subject administration. You can have up to 20 Configurable Codes. 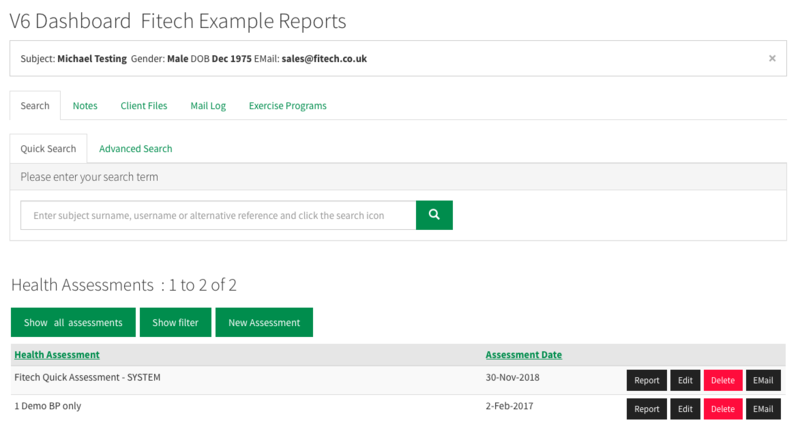 From a single page you can administer all the subject’s assessment reports, make changes, print reports and or send an email with an access link for the subject reports. The subject status bar can also be used to flag individuals, this turns orange if there is an important note logged against them. There also a number of other features you can access from this page explained in the following sections. A sophisticated message/notes tool enables seamless recording keeping and secure communications with the subject. Unlimited consultation notes can be stored and if you elect can be shared with the subject via the subject dashboard (more on this in another section). 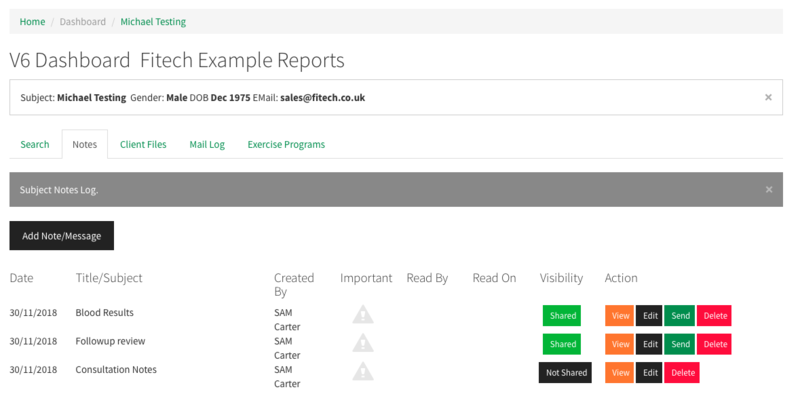 From the same tool, messages can be sent to subjects over email or to the subject’s dashboard only. In this instance, a notification email will be sent to the subject asking them to login and review a message. The subject can both reply and send messages back into the system via their dashboard. This function is useful for audits, employee sickness and fitness management. Store unlimited files against a subject. The system can generate multiple training programmes can be both printed and emailed to the subject. The subject can also access all their programmes via their personal dashboard. Training programmes are quick to set up and easy to update. You can create unlimited programmes per subject. You can also create programme templates for an even quicker build. 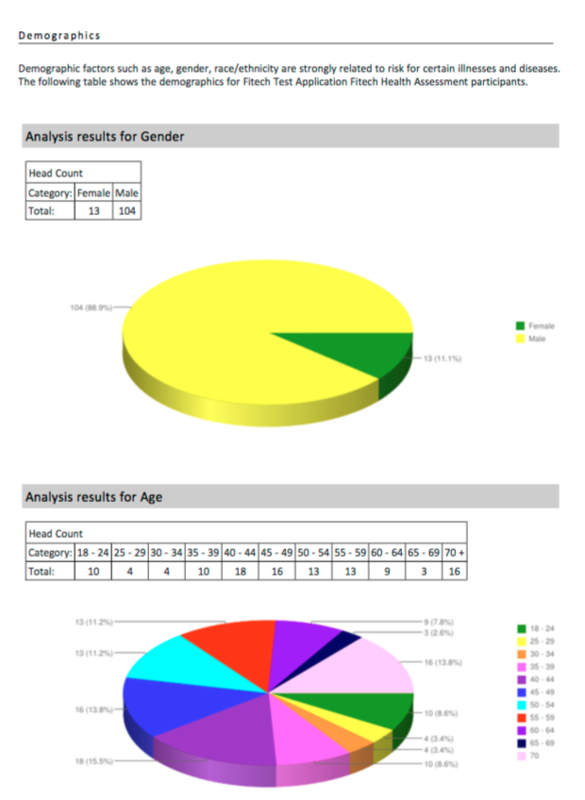 Group reporting enables the production of graphical analysis collating all the results from assessment activities. 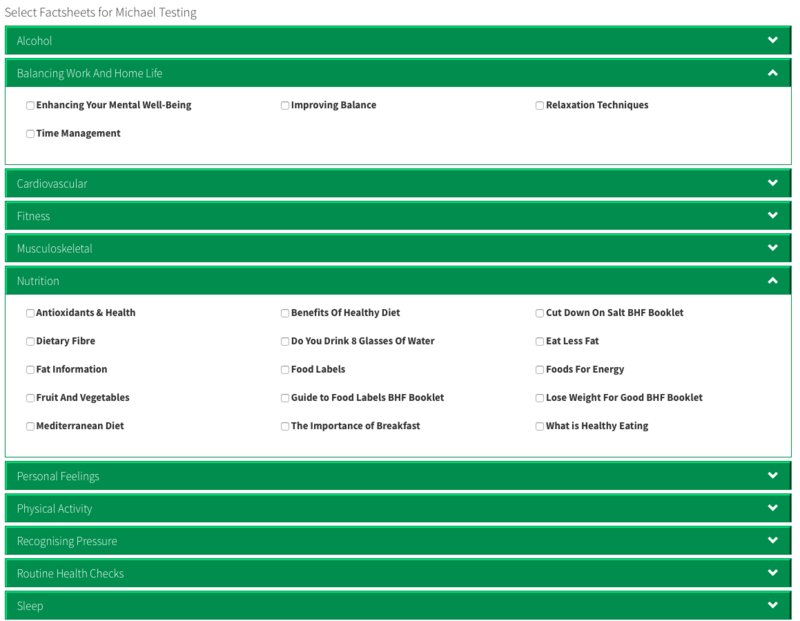 Reports can be filtered based upon subjects’ configurable codes, assessment dates and grouping/branding options. The reporting function occurs via a separate portal so reporting administrators do not have access to personal health information. For clients on the premium service there is the ability to request customised data reports and data exports. Data exports can also be set as a routine service pushing information to other systems. Our analysis team can also provide consultation and supporting in ensuring maximal benefit is achieved. For clients on the premium service there is the ability to request automated alerts. These can be based upon key health risks for example. Weekly reports can be sent to senior medical advisors highlighting subjects for referral. From an operational perspective, reports can also detail activity such has how many assessments has a location and or a person completed in a time period. Some organisations require fit for role certification based upon specific parameters. The Fitech system will generate a obtainment certificate and email this to the relevant authority. Available for clients on the premium service only. 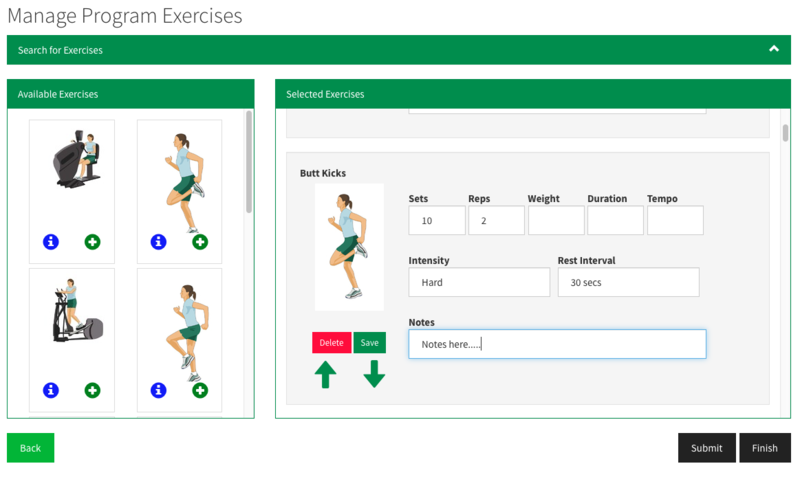 Subjects (the focus of the assessment) are provided with a unique access URL that when combined with a PIN will enable them access to all their reports, personal training programmes and a whole host of other features online. The URL link is sent at the end of the first assessment. This dashboard can be accessed via all forms of digital media. A large factsheet and self-help programmes library are available to support the subject. 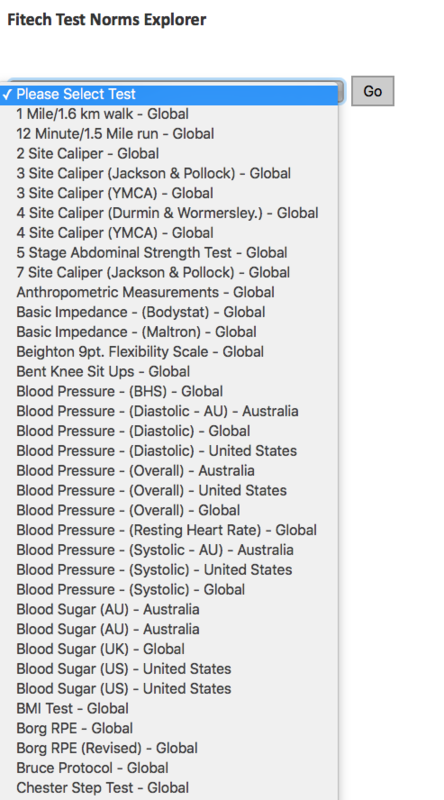 These are selected by the operator at the end of the assessment and will be made available via the subject dashboard login. Clients are also able to add their own files to this area. Via the subject dashboard, the subject is able to view, reply and post messages directly to the system. These messages are contained within the internal network and thus to not travers the internet for ultimate security and privacy. As a safe guard, messages posted by subjects should be read within 7 days, if they are not the application administrator will be notified that there are unread messages. The subject will also be notified when the message has been read and by whom. Messages sent into the system from subjects can be accessed in a common inbox. Operator access to this inbox can be restricted by activating the grouping option. Pre-scripted messages can the automatically emailed to subjects. The configuration works on the number of days since a specific assessment type. This can be further fragmented by a specific assessment type and group with the application. Messages can also display branding based upon the application group configuration. Fitech is a system to support health professionals, this include promoting their brand. When combined with automated follow-up emails our survey tool can enable direct feedback on the performance of your service. Any number of questions can be asked, the Fitech team will help you build multiple surveys that focus on the factors that will make a difference. Responses collected can email emailed as a consolidated report, or clients can login to review the data as required. For all clients we provide direct assistance when setting up, this include remote training session on system set and customisation. In addition for a fee, we also delivery training workshops which normally incorporate other key skills such as cholesterol and diabetes testing. These workshop courses included a certified competency module with certificate which last for 3 years. The training workshops are mainly delivered in London, however subject to numbers we can deliver these anywhere as required. Fitech has been supporting health professionals for over 30 years. The key for delivering health, fitness and wellbeing assessments is having the right equipment for the job with quick supply times for consumables. Our knowledgeable staff can assist you in selecting the right kit for the job and market rate you are delivering at. Orders placed on our online store before 1300 on a business day are sent the same day. The Fitech application is designed around segregation of duties. This means key roles are separate and specific to the persons role. For example, a system administrator can only access the configuration options and not the results information from assessments. Operators, the people whom enter the assessment data, can also be segregated so that they can only work with people within their ‘group’. This is particularly useful if you employ contractors and or when delivering to corporate entities you could provide the occupational health team with an access to account to see their people only. *Additional login account may incur more fees, subject to contract volume. The Microsoft Azure platform offers unrivalled performance and resilience. With 24/7 network monitoring and dedicated security specialist ensuing the data and access is safe and secure. We host our system in two European data centre locations, if one site fails the other centre will take over. In addition, we take continuous backups into the third storage location just for extra assurance. Image is important! Our application is able to manage multiple ‘images’ on your behalf. Thus your reports, associated email signatures and email address can be specific to the projects you are working on simultaneously. Example; you have three clients. The first client has just purchased health checks from you which you are delivering in your own branding. The second client has hired you to support their own internal health team, so all the reports need to carry the ‘corporate’ logo and the report emails need to come from a special group email address. The third client is a health insurance business whom has contacted you to deliver on their behalf; so the reports and email signatures need to look like they come from them. They also want a follow up email to be sent 5 days after the initial assessment with a feedback link, this also has to carry their details. Within the application when entering subjects for assessments you can set which group, or brand, they belong too. This will automatically set what brand that subject sees, including the automated email that is sent 5 days after the initial assessment. These options are very easy to configure. 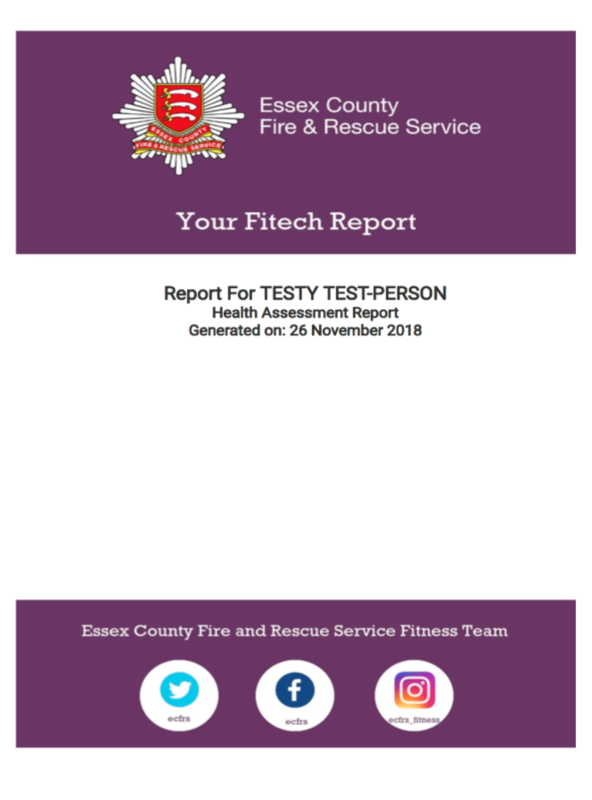 At the end of the assessment process you can, in addition to printing the personal health status report, send an access link for the report to the viewed online via the subject’s personal dashboard. The text in the email can be custom set on multiple levels, with a default set to your organisation and then a set of text for each group, or brand that are delivering too. This can add a level of sophisticated communication. Imagine you are delivering to an international company with multiple locations. The email text and signature block could be configured to reflected the location of the subject and thus contain details what local resources are there to support the subject improve their health and wellness. Each system Operator will have their own login. This login will also include their email address for the purposes of security identification. Operators can communicate with subjects and send report links via the system. Some organisations do not provide their Operators with corporate email addresses. In this scenario the Operator will have to use a personal email address. It is important that we have a secure email address with the Operator as this allows us to conducted authentication checks. However, you do not want this email address to be shared with your subjects. When delivering to customers directly you use your own brand, all your Operators have corporate emails address from your company and as such when they send messages and reports it can come from them showing their corporate email address. You have hired come contractors to support you, these Operators will have temporary accounts on the system and will not have a corporate email address. For these temporary staff you can set it so that they use a ‘group’ email address that is set to your company. At the same time, you have another customer whom has contracted you to deliver on their behalf. So, all Operators need to use a group email addresses that belongs to the customer to maintain their image. The system can manage this simultaneously, one system using a single method but displaying multiple brands and image profiles.